National Women’s Business Council Small Business Roundtable. Together, Kathy and Kendra have led the charge within their chapter to engage with public servants, like Iowa’s Governor Kim Reynolds, as well as participate in important events, like the recent National Women’s Business Council Small Business Roundtable, which was attended by around 40 people, including Iowa’s first female Senator Joni Ernst, local women small business owners and those engaged in assisting and promoting small business at the state and national levels. Additionally, they have worked to strengthen their relationship with government agencies like the Small Business Administration (SBA) and Iowa Economic Center. 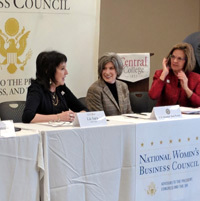 Kathy and Kendra also made important inroads at March’s National Women’s Business Council Small Business Roundtable. Senator Ernst was involved in bringing the event to Pella, Iowa, to discuss rural women’s entrepreneurship. 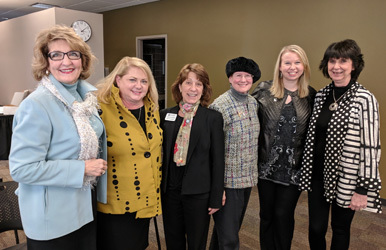 Six NAWBO members from Pella were on hand for the discussion, including NAWBO member and SBA Iowa District Director Jayne Armstrong. “It was a discussion and Q&A with Senator Ernst to hear what she is doing through her appointment by the president to the U.S. Senate Committee on Small Business and Entrepreneurship,” explains Kathy. “She has three pillars for 2019: access to funding for rural small businesses, young women in STEM and entrepreneurship and rural small business ownership. We also discussed paid family leave, infrastructure, broadband and defining micro businesses versus small businesses since 90 percent of women business owners in Iowa are solopreneurs.” Another takeaway the NAWBO women in attendance received from Senator Ernst was this: Overcome the feeling of intimidation of walking into a room full of men by being the expert. If you know your “stuff,” gender can’t be an issue. About 200 miles away in Kansas City, two NAWBO leaders—Vicki S. Cannon (left) and Dawn Potts (right)—have been making similar progress in getting invited to the “table.” Dawn, a financial advisor and owner of H2O Cleaning that serves the construction industry and is WBE-certified in Kansas City, Missouri and the state of Kansas, has been a member for five years and board member for four. 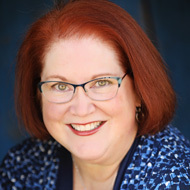 Vicki has owned her social media consulting and training business for nine years and been part of NAWBO for three. She immediately got involved in leadership and is the chapter’s current director of programming. To accomplish this, Kansas City’s leaders have made it a point to participate in NAWBO National’s monthly advocacy calls as well as talk to other chapter leaders about how they’ve grown their efforts locally and beyond. They have spoken with other women’s groups to introduce NAWBO and see where they might align on issues. 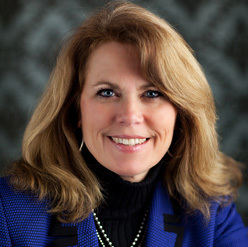 Additionally, they have launched a postcard campaign to local and statewide politicians in both Kansas and Missouri so that NAWBO is known and top of mind, and have developed a list of key public servants to personally reach out to and develop relationships. 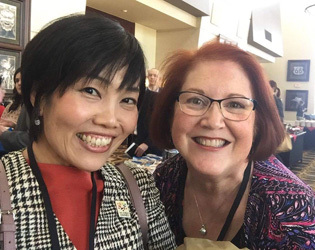 “We also hope to continue doing things like fieldtrips to the Kansas and Missouri state capitols, and going to NAWBO National’s Advocacy Day in D.C.—this year we have eight members joining us so far,” shares Dawn. 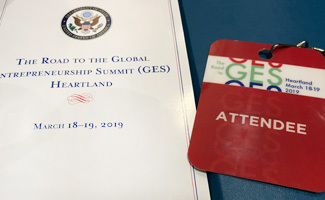 One opportunity to become more aware and build relationships came at the recent Road to GES Heartland USA event in Kansas over two days in March—which was a prelude to the larger Global Entrepreneurship Summit in Amsterdam. The event brought together hundreds of entrepreneurs, investors and public and private sector leaders from across the Heartland who are building innovative solutions to agriculture, health and connectivity. The event was designed to encourage deals that advance economic growth and prosperity in the U.S. and around the world. the world. Setsu is from Japan. Vicki and Dawn also used the event as an opportunity to let more people know about NAWBO. They weren’t given event nametags, so they wore their own with the NAWBO logo. It was a great conversation piece that sparked interest in our organization. They even met women they were able to connect with NAWBO National as well as the Chicago chapter. In the end, they left with the feeling that the event shone the light on the impact of women and small businesses owners and that opportunities abound for us all—even in the Heartland.